Jesus saw this one lying there, and knew that he had already been much time in that condition, and He said to him, “Dost thou wish to become well?” [Jn. 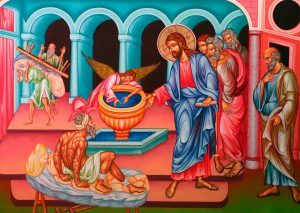 5:6] We read in the Gospel of John how that on occasion an angel would come and stir the water which on occasion would heal infirmity. That is, if you could be the first one in the water. 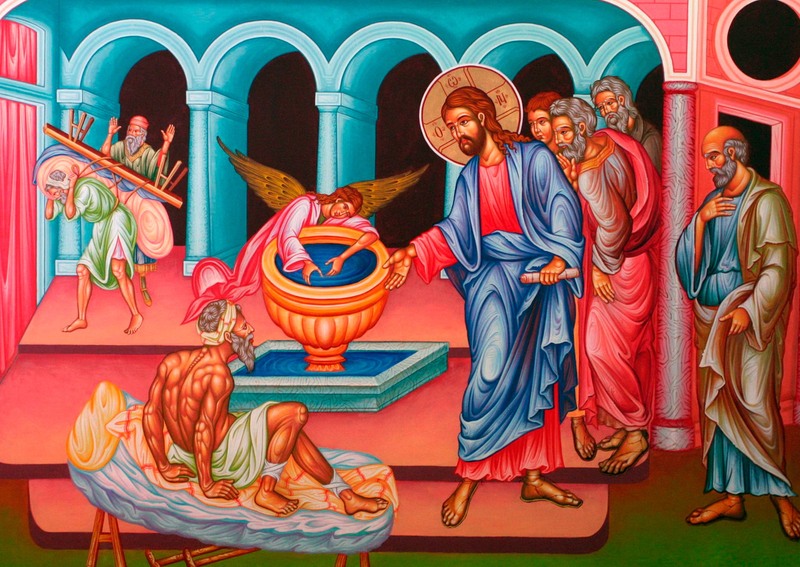 For 38 years the paralytic struggled and could not reach the healing water! You see, the evil one likes to stir the waters in our life, but not for healing. For with his temptations, he wishes us to turn from God in anger and disbelief and become paralyzed from every attempt in seeking the Kingdom of God, truly a death-sentence. “Dost thou wish to become well? … Behold, thou art made whole: sin no more.” Joy has come unto the world through the cross and death has been conquered by death. There is no salvation apart from Christ! From the Profit Ezekiel: “And it shall be that every living thing that moves, wherever the rivers go, will live. There will be a very great multitude of fish, because these waters go there; for they will be healed, and everything will live wherever the river goes.” (Ezekiel 47:9) Come, won’t you receive the Healing Water and turn from the death-sentence of sin?